1st. Seat the factions in this clockwise order: Marquise, Eyrie, Alliance, Vagabond. 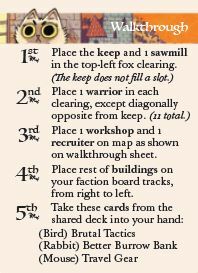 Along with their faction board, hand each player their faction's walkthrough card. 3rd. Do not draw 3 cards for each player. Instead, the walkthrough cards will tell the players to take specific cards from the deck. 7th. Follow the setup on the walkthrough cards, not on the faction board backs. Everyone sets up at the same time, not in order. 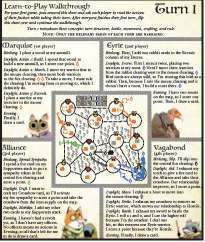 When you start playing, give the walkthrough sheet to the Marquise player, and ask them to read the text in the Marquise's box aloud as they're taking the actions described. When their turn is over, pass the sheet to the Eyrie player, and have them read their actions aloud as well. After everyone has taken their first turn, flip the sheet over and go through the second turn, as before. Throughout this process, encourage everyone to ask questions. 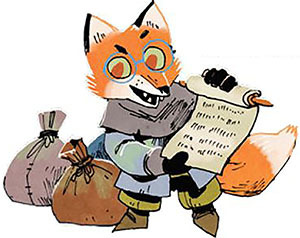 You will likely be able to answer questions about shared concepts such as moving and battling with little reference to this guide. If someone asks about their faction, encourage them to look over their faction board-it is designed to answer most of those questions. Don't be dismayed if play is interrupted to explain the finer points of battling or crafting. 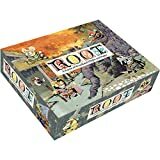 For most players, Root is best learned organically. After a few rounds, the game should flow seamlessly.